The 7” Touchscreen Monitor for Raspberry Pi gives users the ability to create all-in-one, integrated projects such as tablets, infotainment systems and embedded projects.The 800 x 480 display connects via an adapter board which handles power and signal conversion. 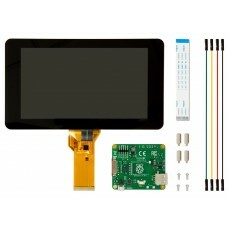 Only two connections to the Pi are required; power from the Pi’s GPIO port and a ribbon cable that connects to the DSI port present on all Raspberry Pi’s.Touchscreen drivers with support for 10-finger touch and an on-screen keyboard will be integrated into the latest Raspbian OS for full functionality without a physical keyboard or mouse. Once installed, type ‘sudo apt-get update’ and ‘sudo apt-get upgrade’ and ‘sudo rpi-update’ (in that order) to install all of the latest drivers and software to support the Touchscreen Display.